Monday already? Where does the weekend go? I hope you all had a good weekend. We did! The weather was pretty crazy though. It was much cooler than usual and OMG it was so windy. Yesterday the winds were over 20 MPH. We almost weren't even going to attempt to take blog photos. But I put my hair up and we just decided to try. Andi almost blew over a few times. I love casual outfits like this. This T-Shirt is so good. I also have it in white and I wear it all of the time. It is currently on sale (and so are my earrings). It is a great staple to have, you can never go wrong with stripes. Also, These jeans are only $64! As I am sure you all know I LOVE my AG jeans. I have a few pairs and I wear them all of the time. But I was so excited when I tried these on because of the price, the fit and the quality. If you are looking for a good pair of inexpensive jeans these are really good. I have a few pairs from this brand from a couple of years ago. I also linked a couple of other pairs that are a really great price. I tried on one pair and almost bought them as well. You're looking adorable in this comfy and stylish, daytime outfit! I like your wedges and bag very much! This outfit is exactly something I'd wear during the week with my little one. 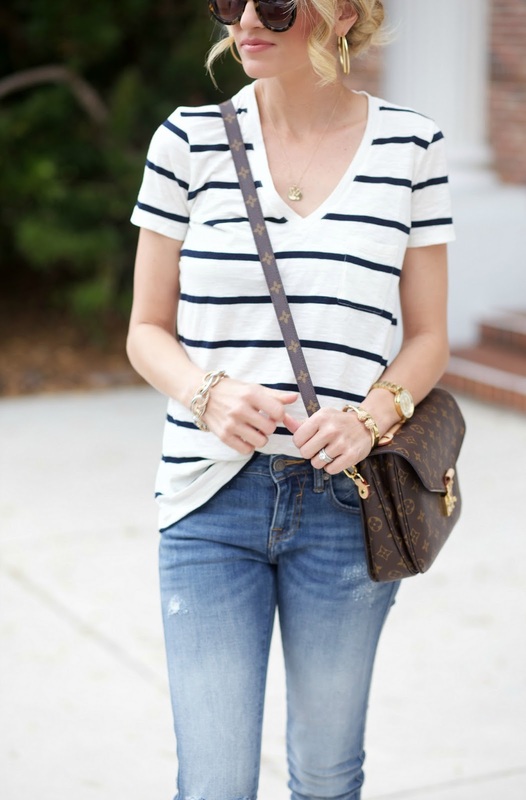 I love a good stripe tee! What a gorgeous casual look, love it!